This pouch is like carrying an entire drawer with you wherever you go. Keep it on hand to easily access stationery whenever you need it, or use it on your desk to safely store your important items. The Drawer Pouch is a new partner to the Hobonichi Techo. Like a Hobonichi Techo cover, it can store many items despite its compact size. Peacocks of Grantham Hall is a pouch that uses a Liberty Fabrics textile, famous for its beautiful colors and intricate designs. The pattern of peacocks sitting on a lawn was drawn by actor and producer John Malkovich. Peacocks of Grantham Hall was offered as a Weeks cover in the 2016 Hobonichi Techo lineup and was a big hit. The pouch interior is a sophisticated shade of off-white, with a cute pink-beige tassel attached to the zipper pull. The Large Drawer Pouch’s accordion-style opening gives it plenty of room for accessories, stationery, cards, documents, checkbooks, and more while making it easy to organize all of them by category. Inside the pouch are card sleeves, a zipper pocket, and an expandable mesh pocket. Behind the 9 card sleeves, which can hold a variety of cards vertically, is a large pocket that can hold a full-size piece of printer paper folded in half or an A5-size folder. 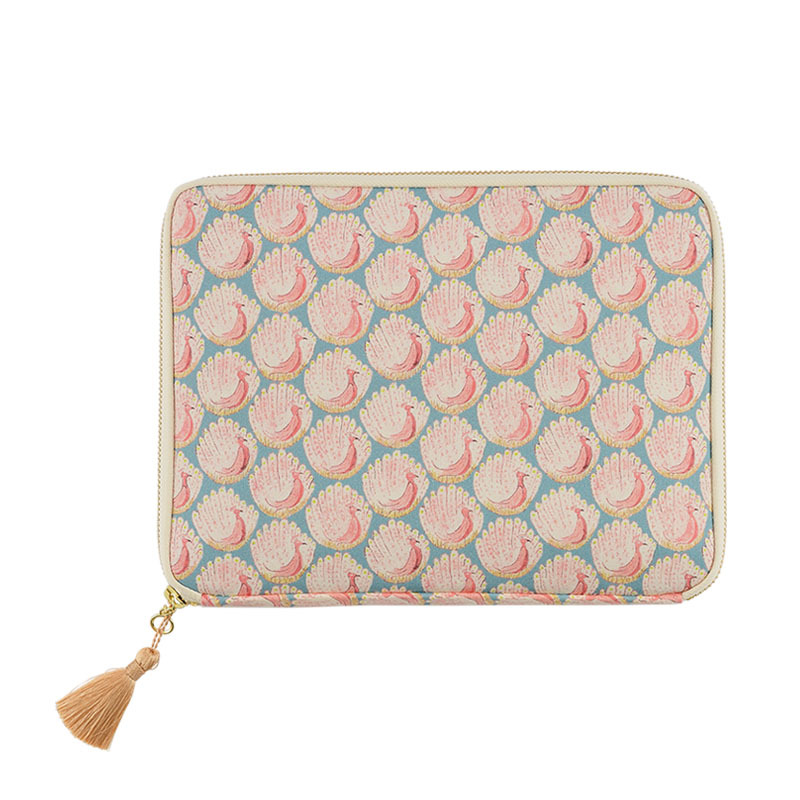 The small pockets are also ideal for storing and organizing sticky notes, stickers, washi tape, and other handy items. The zipper pocket in the middle of the pouch interior is about 9 cm (3.5 inches) deep. It’s handy for storing pens, erasers, or any important or small items you’d like to secure with a zipper. The mesh pocket can store A5-size papers, or printer paper folded in half. Because you can see the contents of the pocket, it’s perfect for storing important items you’ll need, such as checkbooks or tickets. The pouch exterior has another pocket large enough to hold A5-size items. The pouch can hold many items, but its slim size and compact shape make it easy to fit into a bag. Keeping all your important items together in this pouch will leave the top of your desk and the inside of your bag much more organized. You’ll always be able to find what you need. It’s perfect for carrying around with you so you can access things right when you need them. You can separate and organize items within the pouch, like pencils, paperclips, washi tape, thumbtack tins, and other stationery. The pouch can provide storage like a tool box. Now you have a new “business associate” who can hold your notes, cell phone, business cards, receipts, and other important paperwork. One handy way to use the pouch is by mixing business and pleasure. Store everything you use on a regular basis, from your debit card to lip gloss. The pouch can act as a suitcase to store all your most important documents. The pockets come in various sizes to sort papers by type, so you can organize contracts, bills, receipts, and more. A travel pouch can be a big help on trips when you know exactly where to find everything you need, such as foreign currency, maps, tickets, travel plans, and more. It makes traveling easier, and can even act as your wallet during your time abroad. Use the pouch as an in-flight carrying case for handy items, such as an eye mask or toothbrush. Expectant mothers can have peace of mind by consolidating all the important health information that comes with having children. Use the pouch to store all your paperwork, patient registration cards, or other information you receive as your child grows. The pouch makes a great medicine bag. Store your medicine, prescription orders, and instruction papers along with all the other notes you receive from your doctor and pharmacist to keep track of your daily medicine. W: 270 x H: 208 x T: 20 mm / W: 10.6" x H: 8.2" x T: 0.8"
Each and every product is individually made by a factory worker. Best efforts are made to ensure consistent sizes and specifications, but there may be slight differences. Avoid exposure to the sun or humidity to avoid deterioration. Avoid storing objects that are too heavy, or stuffing the product too full, as this may result in tearing. Please handle with care, as the material may fade in color or cause stains if wet or rubbed against other objects. Do not wash this product, as it may distort in shape or lose color. Do not use benzine, solvents, or other alcohol-based cleaners. Please open and close the product by pulling on the base of the zipper pull itself, and not the tassels hanging from the zipper pull. Pulling the zipper by the tassels may result in damage. Please handle with care. Pulling the strap in extreme directions or pulling it too tightly may result in damage.